Провідні письменники, митці, режисери і громадські діячі звернулися до державного секретаря США Рекса Тіллерсона із проханням підняти питання про негайне звільнення Олега Сенцова на переговорах із російською владою. Відповідну петицію ініціював американський ПЕН-центр, що у квітні 2017-го нагородив Олега Сенцова премією “Свобода писати”. “Ми, письменники, митці, режисери і продюсери, приєднуємося до PEN America, щоб висловити протест проти необґрунтованого ув’язнення нашого колеги, українського письменника, кінорежисера і активіста Олега Сенцова, і просимо вас виступити на його захист на зустрічах зі своїми російськими колегами з метою його негайного звільнення”, – йдеться в петиції, спрямованій до державного секретаря США Рекса Тіллерсона. У петиції коротко описано обставини справи, сфабрикованої проти Олега Сенцова, засудженого на 20 років за звинуваченнями у тероризмі, охарактеризованого його кінематографічну творчість та громадську діяльність, і зазначено, що Олег Сенцов виявив непохитну мужність в жорстоких умовах, які після затримання створила для нього російська влада. Американський ПЕН-центр закликає долучитися до численних митців і письменників, що вже стали на захист Олега Сенцова, аби, разом із ним, захистити цінності свободи слова. І просить держсекретаря США Рекса Тіллерсона відстоювати справу Олега Сенцова перед російськими посадовцями і виступити за його негайне звільнення. Нижче подаємо текст петиції англійською мовою, яку вже підписали, серед іншого, режисери Вім Вендерс, Бертран Таверньє, Агнешка Голланд, Фолькер Шльондорф та письменники Салман Рушді, Джон Максвелл Кутзее. As writers, artists, directors, and producers, we join PEN America to protest the groundless imprisonment of our colleague, Ukrainian writer, filmmaker, and activist Oleg Sentsov, and request that you advocate with your Russian counterparts for his immediate release. Mr. Sentsov, the 2017 recipient of the PEN/Barbey Freedom to Write Award, has been languishing in a Russian prison since May 2014, when he was detained in his native Crimea and forcibly brought to Moscow on allegations of terrorism. International governments and human rights groups have condemned these charges as fabrications by the Russian government in retaliation for his criticism of Russian President Vladimir Putin’s interventions in Ukraine and annexation of Crimea. Nonetheless, Sentsov was convicted in a Russian court, given a 20-year sentence, and transferred to a Siberian penal colony. Mr. Sentsov disappeared from the Crimean regional capital of Simferopol following a demonstration on May 11, 2014. He resurfaced several days later in custody in Moscow. Held on unspecific charges of terrorism for months on end, through multiple court-ordered extensions of his arrest, his trial finally began on July 21, 2015. 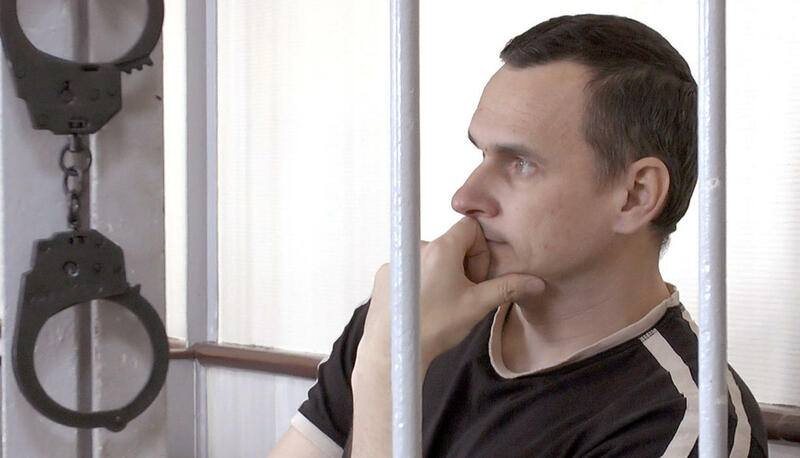 On August 25, 2015 — despite Sentsov’s statement that he was tortured in an unsuccessful attempt to extract a confession and only vague evidence offered by the prosecution — he was convicted on charges of creating a terrorist group, carrying out two terrorist acts, and plotting the explosion of a statue of Lenin in Simferopol. Two appeals of the verdict have been rejected, as has a request for Sentsov to be extradited to Ukraine, although at least one of the witnesses for the prosecution has since retracted his testimony, claiming his statement was made under torture. President Putin himself has rejected calls for Mr. Sentsov’s release, maintaining that he was not convicted for his art or opinions, but because he had “dedicated his life to terrorist activities.” Sentsov’s best-known artistic work is the 2011 film Gamer, revolving around a Ukrainian boy whose enthusiasm for computer games isolates him from his family and friends to the point that he must finally make a choice between his obsession and his humanity; his best-known instance of activism is supplying food and medicine to Ukrainian soldiers blockaded in bases by the Russian military during the Crimean crisis in 2014. The filmmaker’s amplified voice of opposition in Ukraine made him a ripe target for Russian stifling of dissent, but there are many other such cases in which critics have been arrested, tried, imprisoned, attacked, or worse. This has resulted in a marked chill in the environment for free expression in Russia in recent years, as noted in a PEN America report Discourse in Danger: Attacks on Free Expression in Putin’s Russia and by human rights defenders internationally. Given President Putin’s brazen willingness to flout human rights norms and the rule of law, and his relentless targeting of dissenting writers, artists, activists, and politicians, it would be irresponsible to heed Mr. Putin’s wishes and ignore Sentsov’s plight. Oleg Sentsov has shown unflinching courage in the face of brutal treatment. A multitude of Russian artists and writers have come to his defense; it is critical that we join them to raise our voices to protect the values of freedom of speech, including the right to dissent. In your ongoing discussions with Russian officials, we urge you to raise Oleg Sentsov’s case, and to advocate for his immediate release.